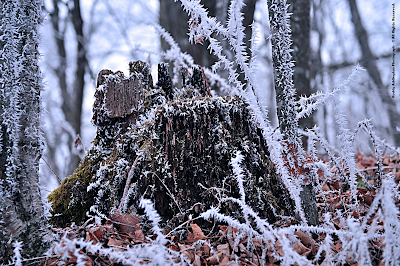 While most were fast asleep the High Knob Massif was busy at work capturing water from the air and extracting it into a visible and usable form called RIME. 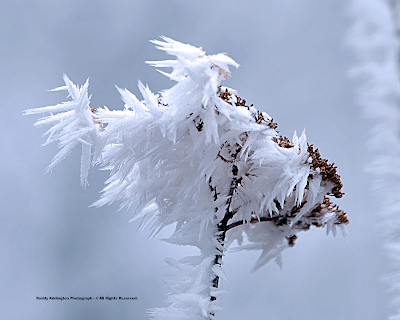 Although the high country snowpack has melted greatly during the past couple of weeks, rime capped ridges blazing above the cold, frozen surface of Upper Norton Reservoir indicated that moisture extraction had occurred even without any new snowfall into February 6. 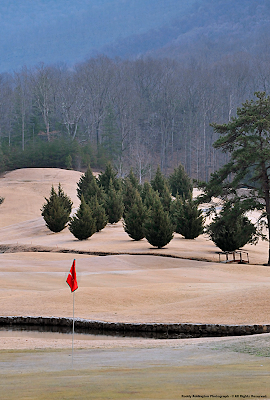 The final week of January and the first week of February featured the mildest conditions since back in November 2010, topping even the mini-thaw that got whitewater gushing to open the New Year of 2011. 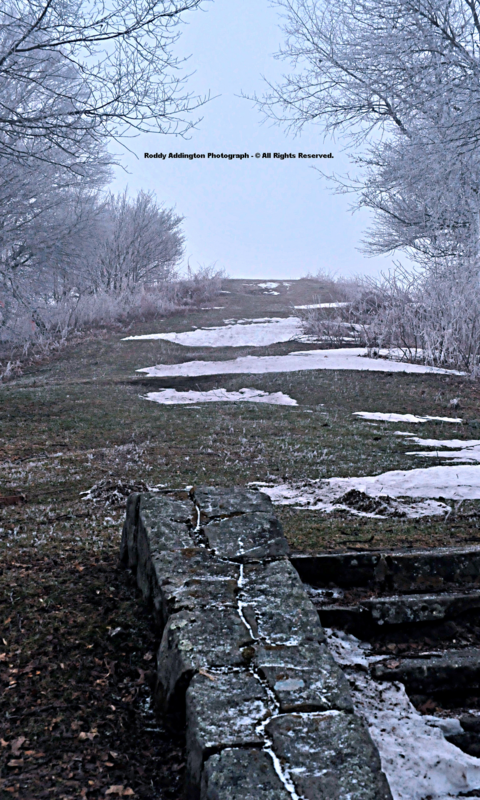 Shrouded in icy clouds, lofty High Knob Lake Basin was fully engulfed by rime and retaining a nearly solid north slope snowpack that Roddy said was visible only at times in the far distance. While the rime zone often includes the Norton Reservoirs, and locations down to around 3000 feet, on this particular day it was highly elevated and generally above 3400 feet. 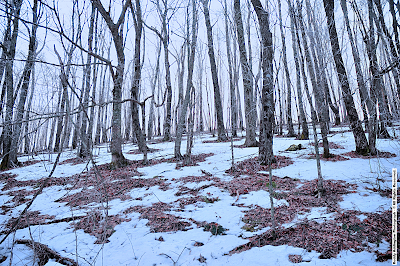 The snowpack was still deep in places on north slopes along scenic State Route 619, between the High Knob peak and Camp Rock Knob, with more patchy snow lingering in other sections. 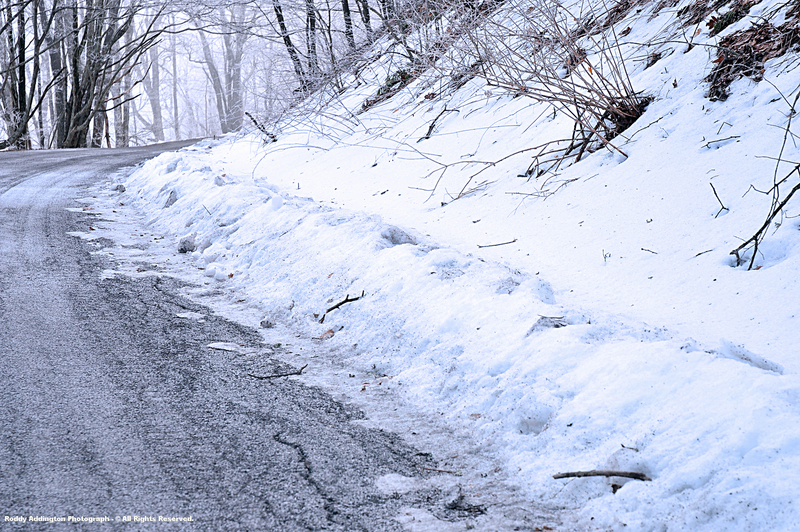 Perhaps one of the most interesting scenes was found where the Big Cherry Basin road joins Route 619, along a SW facing section around 4000 feet elevation, where Roddy said 4" to 9" of snow depth remained in the road like it had been spread out by a dump truck between melted banks! It is always interesting to travel the high country following a long stretch of winter, as unique scenes such as the one above and this next setting below are commonly found. 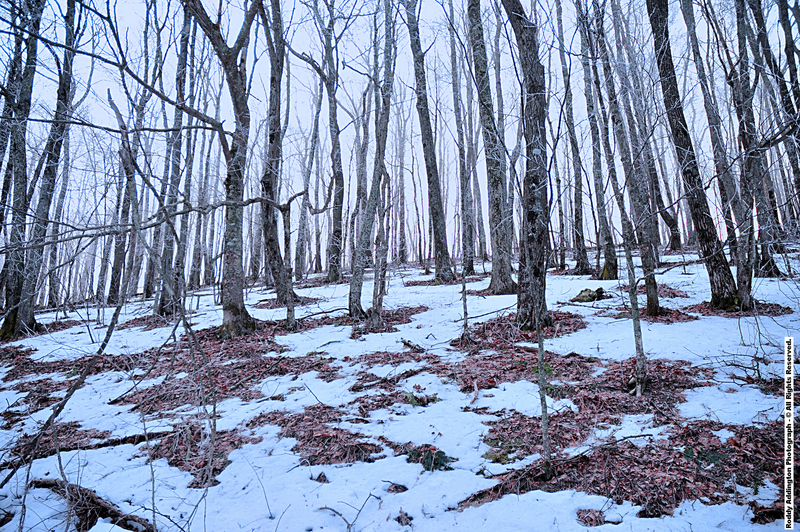 Heading up to wind swept High Knob Meadow, numerous old drift lines were visible stretched across the peak beneath rimed trees. 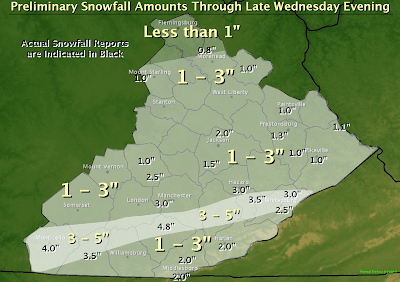 My grandparents & parents always told me that such snow is just, "waiting for more," and that indeed is the case as a couple of snow systems may drop new accumulations upon the High Knob Massif this week ( reference sections below for updated details ). 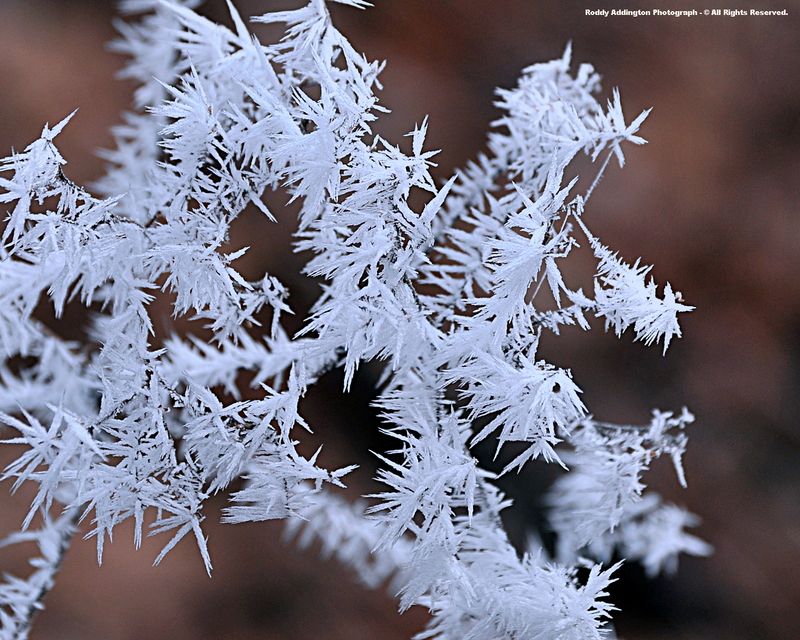 While diverse patterns displayed by an old snowpack are always fascinating, on this day the star of the show was the extraction of water vapor from lightly flowing air upon trees and vegetation to form an array of wondrous, feathery rime. 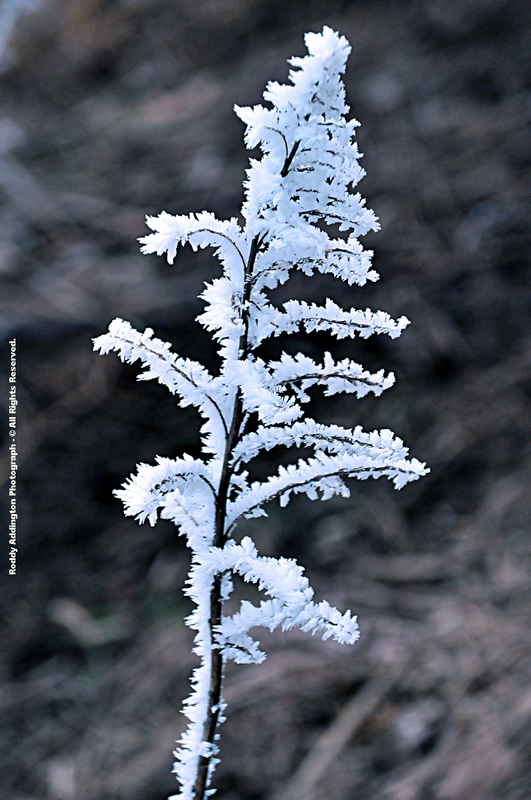 Is the following a fern, or merely a "False Rime Fern," formed by a magical array of crystal growth and deposition? 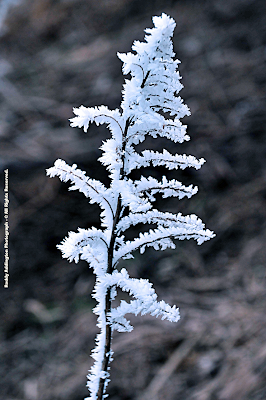 A False Rime Fern Or NOT! ( Highnoptis rimeicus ) if acceptable by our beloved Virginia Natural Heritage Program ( VA DCR ) and Thomas Wieboldt of Massey Herbarium! 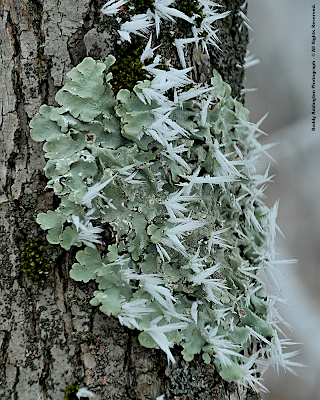 Roddy's great eye lets little pass by, with feathery rime growing outward from an array of lichens forming a rather unique scene not likely to be found "growing" in the lowlands of the grand Old Dominion any time soon! 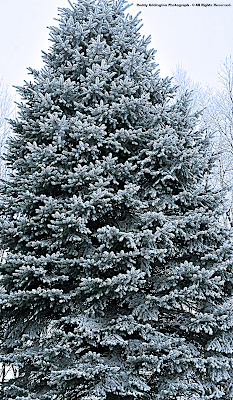 While spruce is not native to High Knob, there are a few about that grow very well amid all its wetness! 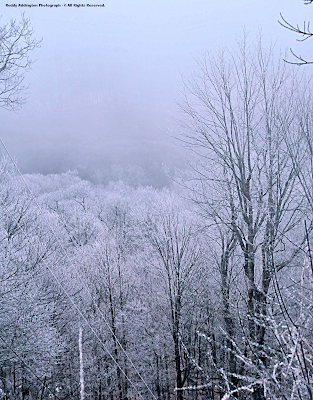 A general 10.00" to 12.00"+ of precipitation have fallen across the High Knob Massif since the dawn of meteorological winter, during December 2010 and January 2011. A comparison with other locations generates the following statistics. Lexington ( VA ): 3.54"
Meadows of Dan 5 SW: 6.22"
Trout Dale 3 SSE: 6.53"
City of Norton Water Plant: 8.99"
*A partial estimate was made on the hand-measured total at Big Cherry Dam during December 2010 due to large amounts of physical gage loss in deep snow falls. January also had physical gage loss in snow but no estimate was applied ( read notes below ). ( M ) - Indicates that the total is less than what actually fell at Big Cherry Dam due to physical gage loss in deep snow falls and evaporation-sublimation between hand-measurements. The 11.86" Big Cherry Dam total assumes that the rain gage caught 86.2% of all the precipitation which fell during December 1 through January 31, despite only 2 hand-measurements made on January 3 & January 31. Given such LARGE amounts of snowfall overflowing the gage, as well as some evaporation & sublimation, it is simply not possible for the rain gage to have caught 86.2% ( wind induced rain gage undercatches being completely neglected in this windy location ). It is therefore certain that this total is less than what actually fell. Absolutely certain! Making a very conservative estimate of loss for Dec 2010 was relatively easy, since the first big snowfall of the month overflowed the rain gage. Essentially all that fell from that point forward would have been physically lost ( i.e., the gage could not have held the LARGE amount of snow which fell ). Once the estimated loss was made, I simply took 50% of its value to make certain it was conservative and remained under what actually fell ( the one thing I never want to do is over-estimate totals with most months, as noted below, being just the actual rain gage value with no estimate applied for losses ). The setting during January 2011 was more complicated, such that an estimate for physical gage loss at Big Cherry Dam could not be made with such confidence. So none was made! Note that only 5 out of these 26 months had any estimate applied due to severe winter conditions, with the remainder of the months being actual, raw rain gage values ( with evaporation-sublimation losses between the hand-measurements ) ]. The above total for Big Cherry Dam is supported by the general 84" to 106" of snowfall observed from the summit level of High Knob ( head of Big Cherry Basin ) to High Chaparral in the December-January period ( when precipitation fell mostly as snow to cause large rain gage losses at Big Cherry Dam ). 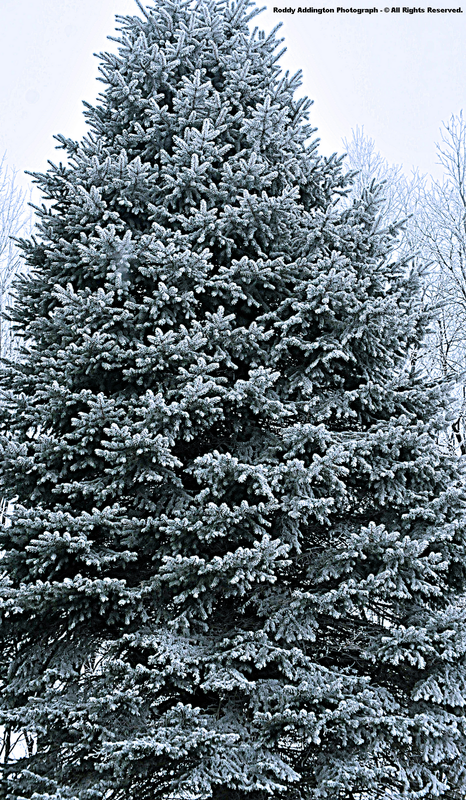 It is very interesting and important to note that none of the moisture contribution from RIME deposition on trees, or fog drip from trees, was part of the Big Cherry Dam total ( these secondary moisture sources are not collected by standard rain gages ). If possible to add the moisture contributed by rime & fog drip to the Big Cherry Dam total it is easy to see why the spillway has overflowed every day since Thanksgiving weekend! 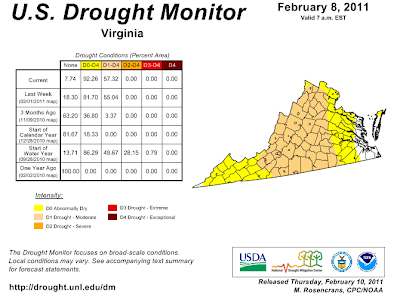 Overflowing with moisture while the state of Virginia as a whole has been slipping into drought! 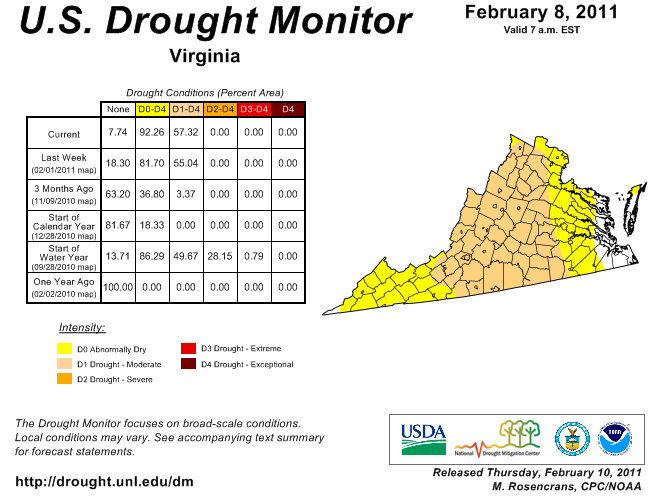 Note that the Drought Monitor depicts regional conditions and has poor resolution with respect to local areas. 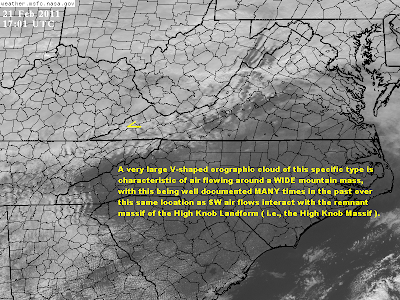 In this case, for example, missing the relative wetness observed across much of the High Knob Landform ( especially its remnant massif ), with an indication of wetter conditions only being displayed for far western portions of Lee County of the HKL. 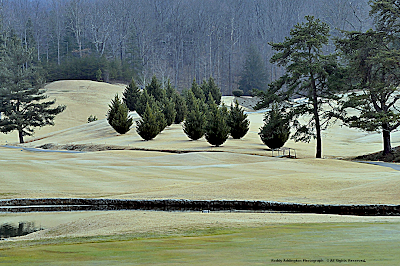 It should be noted that the above is relative wetness as even with the large amount of winter snowfall in the High Knob Massif, the lack of rain and high density ( wet ) snows have the 2010-11 winter running below average for total precip ( average winter precipitation in the High Knob Massif being MUCH above what most locations receive in Virginia, even with significant rain gage losses, as this website is illustrating! ). Although harder to do, a little rime managed to find its way into the wrinkled crevices of a dried out Polypore Mushroom from last year ( likely as air was forced to swirl around the old stump ). 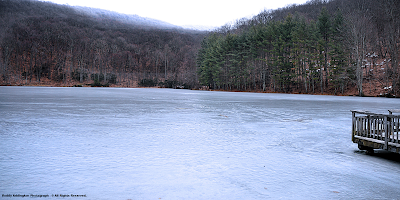 Drop downward several thousand vertical feet and the world is a different place, as this unfrozen water in Powell Valley ripples freely in contrast to the frozen surfaces of lakes scattered across the sprawling expanse of the High Knob highcountry. 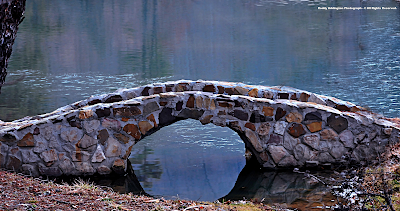 *Keokee Lake rests along the same mountain arm as Appalachia & Rimrock lakes, with the only physical difference being a break in the backbone of the mountain flank at "The Big Stone Gap." This is part of the extended NW arm of the High Knob Landform which stretches from the remnant highcountry of the HKL ( High Knob Massif ) to Cumberland Gap National Historical Park and the I-75 corridor in northern Tennessee ( at Norris Lake ) ]. 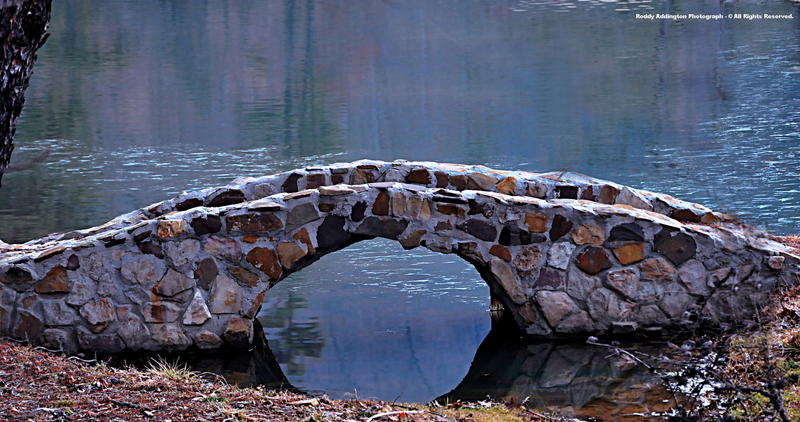 Lakes resting amid the core of the massif are situated in lofty basins with crestlines that offer efficient cold air drainage from elevations as high as 4223 feet above sea level. On an annual basis this gives them a much colder climate, which also enhances the freeze up of their surfaces. The interior snow shadow effect of the massif upon Powell Valley is locally infamous but was never fully realized or documented in detail prior to my long-term climate research and this website. [ The snow shadow effect being extreme but not as dramatic as that which occurs with NW air flows sinking leeward of the massif and HKL into the Tri-Cities of northeast Tennessee ]. New snow covered highest elevations within the crest zone of the High Knob Massif by sunset on February 7, as only cold rain showers fell far below upon winter "greens" at The Lonesome Pine! The first significant snow of February 2011 spread a light but notable 1" to 3" blanket of sticking accumulation across most of Wise, northern Scott, northeast Lee, and Dickenson counties into morning hours of February 8. 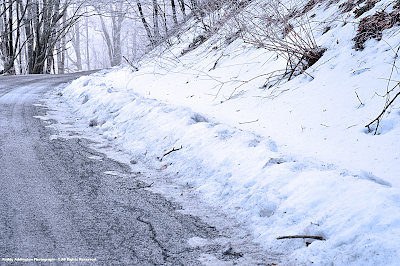 This was enough to make roadways slick and to again close schools in Wise and Dickenson counties for yet another day missed during the 2010-11 winter season. 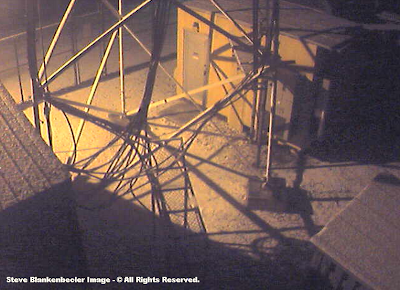 As noted above, it was all snow at the summit level of the High Knob Massif with roof tops on Eagle Knob becoming covered by around dark on February 7. Climatic differences in the vertical were again a factor during this event as only rain fell in lower valleys through most of the evening hours of February 7, with snow levels gradually dropping from upper through middle elevations to valley floors resting below 2000 feet by 11 PM to Midnight. 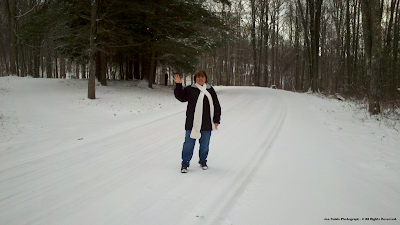 Howdy To All - Snow Covered Again! 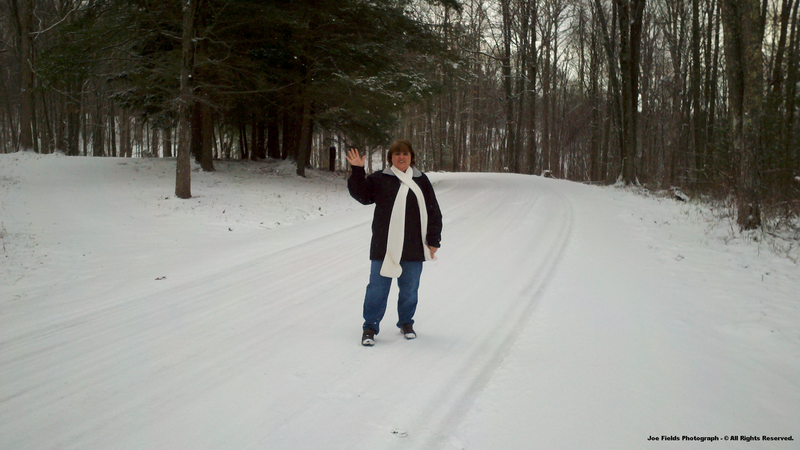 Darlene Fields stands upon a freshly covered main roadway near the U.S. Forest Service Cabin, between the communities of High Chaparral & Robinson Knob, as husband Joe takes a nice picture during the morning. Big, fluffy snowflakes fell off and on during much of the daylight hours of February 8, as weak NW upslope flow continued. 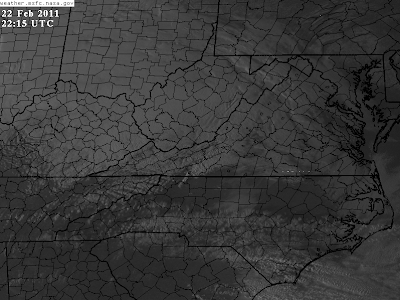 [ Observe the vertically enhanced zone of gravity wave clouds which begin along the Wise-Scott border ( High Knob Massif crest zone ) and spread outward to its lee across much of Scott County, Va., and Sullivan County in northern Tennessee ]. 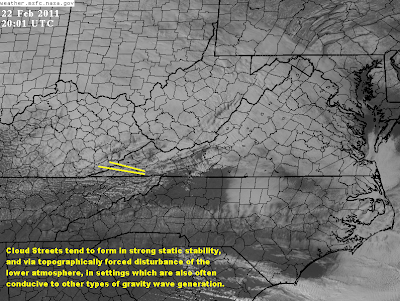 As so often is the case, when under NW flow, an array of orograhic gravity wave clouds were generated along and leeward of the High Knob Landform and southern Appalachians. I find it interesting that such settings can reveal the downstream shadowing zone of the High Knob Massif, as gravity waves come off its highcountry and move downstream in its wake to spread into northern Tennessee ( as observed above ). 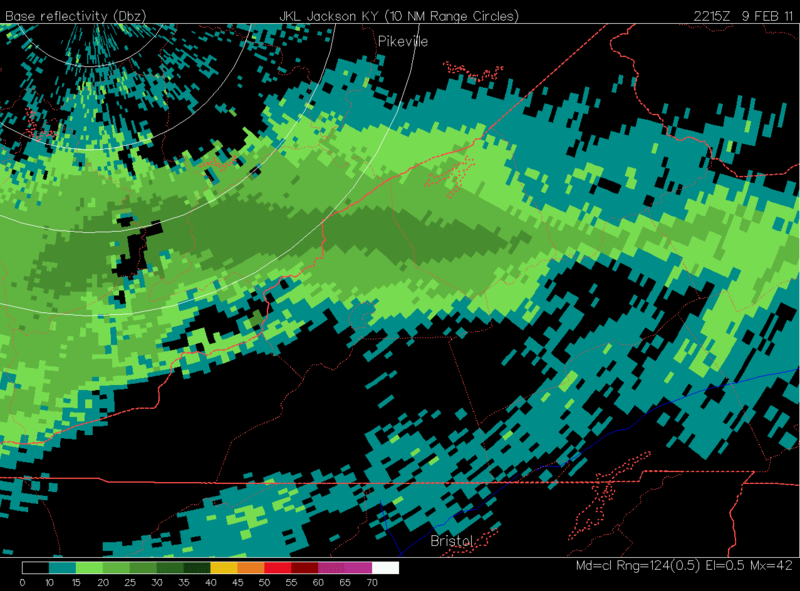 While the actual subsidence zone leeward of the massif and HKL is much wider than the above clouds, it is not a coincidence that they spread across the City of Kingsport and much of the Tri-Cities in this type of trajectory. [ The plume of vertically raised gravity waves in the above setting showing where the massif is perturbing the atmosphere most at that particular time, under that particular combo of wind speeds and directions, such that they should in theory reveal the portion of the atmosphere most impacted by it in a downstream direction amid such a set of conditions ]. Long-term climatology, and individual storm episodes, illustrates that this effect is one of drying and depletion of snowfall as air sinks off the High Knob Landform and Tennessee Valley Divide into the Tri-Cities, which would be much snowier most winters without its influence given a predominance of WNW, NW, N air flows with accumulating snow! 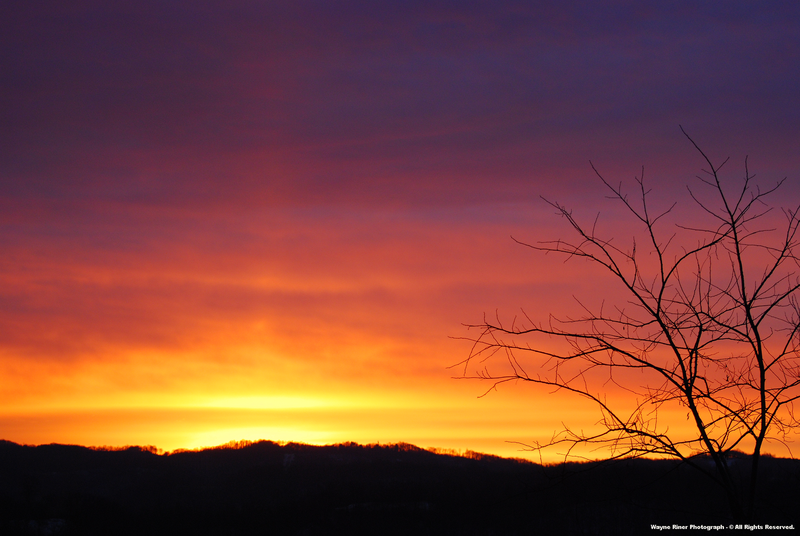 A gorgeous pillar of morning light set the horizon aglow on the morning before the next fall of snow, as captured by my friend Wayne Riner on Long Ridge of the Tennessee Valley Divide. 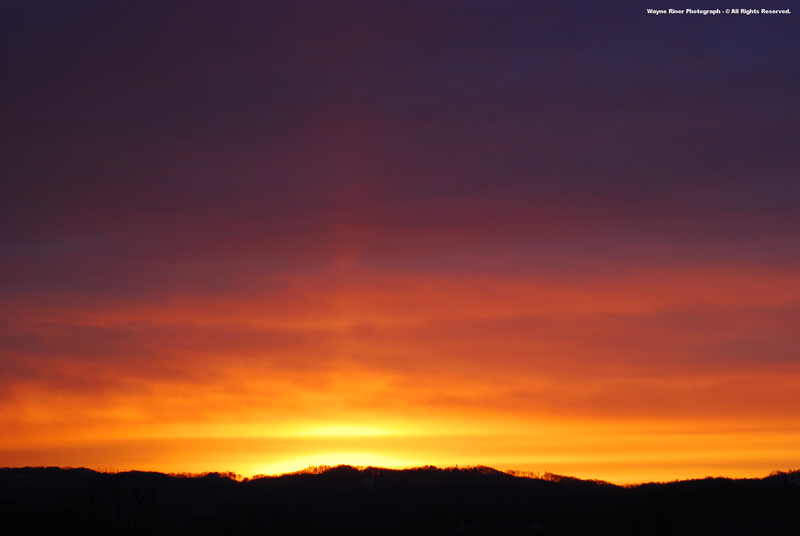 "While taking a picture of the February sunrise, I noticed a very faint streak of vertical light from the sun's location. 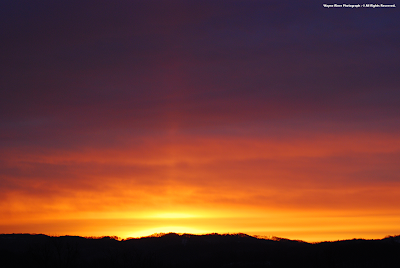 It is called "A Pillar of Light" and is caused by the reflection of light ice crystals in the atmosphere. Look closely." It was a glorious morning of light! 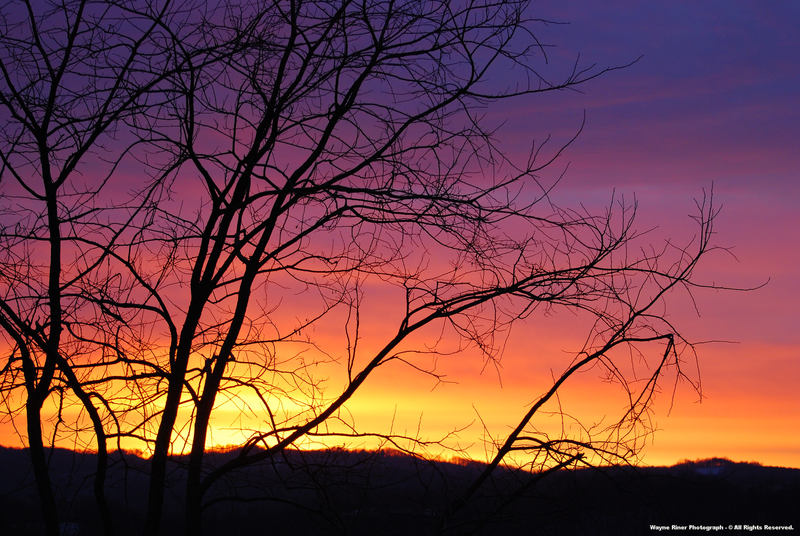 "﻿With snow still on the ground, the sun has grown stronger and is going to give us a warmer week. 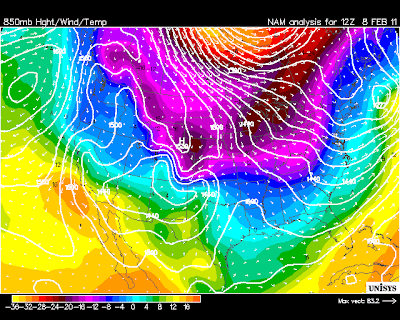 This will be an anticipated taste of the warm spring to come. 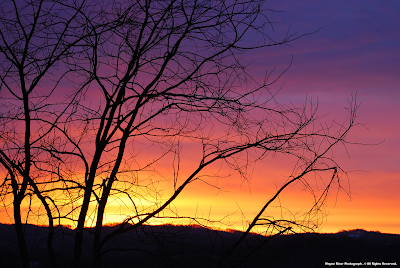 With a background of color, the black locust welcomes the morning sun." A narrow but heavy band of snow developed just north of the High Knob Landform ( HKL ) and Tennessee Valley Divide during late afternoon of February 9. 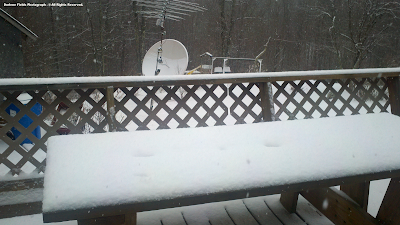 Very fine, steady snow quickly changed into big, fluffy flakes as the snowband set up, with a furious fall depositing 1" to 2" of depth on northern Wise County into portions of Dickenson and Buchanan in Virginia between 5 & 6 PM. 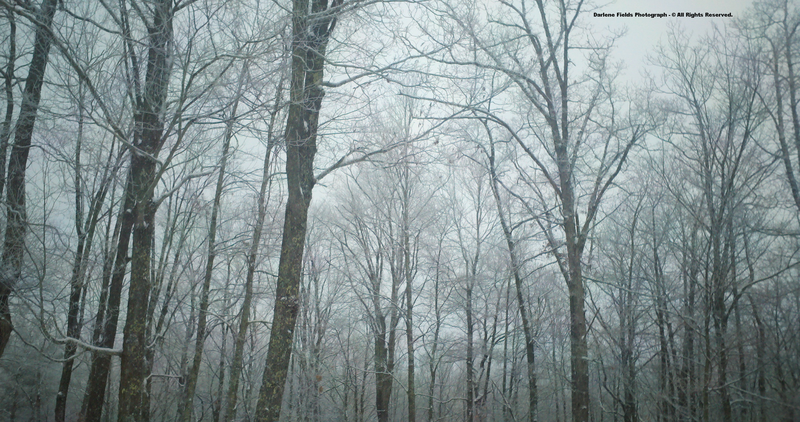 This was part of a long, narrow, band of heavy snow that actually stretched across the Kentucky foothills to just north of the highest mountain terrain in Virginia. This caused a rarity, not often observed, as 3" to 5" of snow fell along a Pound to Clintwood and Birchleaf corridor in contrast with 2" to 3" from Wise and Norton across the High Knob Massif. ( 2.5" verses 4.8" ) for a switch! 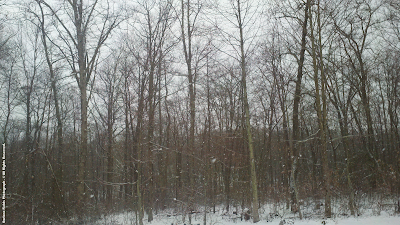 While snowfall during this event was greater in Clintwood, total snow depth remained deeper across the main crest zone of the High Knob Massif with variations from less than 6" to more than 12" ( snowfall during the February 7-9 period adding to the old depth photographer Roddy Addington documented ). Cloud bases lowered amid this latest surge of bitter air to drop rime levels below the elevation of High Chaparral to generate a much deeper zone of water capturing by the massif than that associated with the February 6 episode. Up at the summit level of the High Knob Massif, where around 10 feet of snow have fallen this winter, morning temperatures in the single digits were a signal that a very cold night was upcoming for mountain valleys as skies cleared. 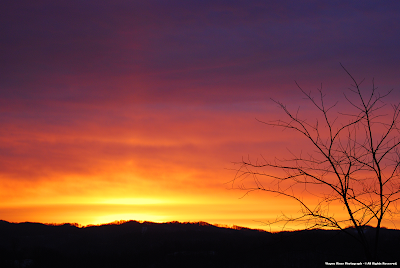 Morning MINS into early on February 11 dropped below zero within the lofty, snow covered basins of the High Knob Massif, and to 2 above in both the City of Norton & Clintwood. 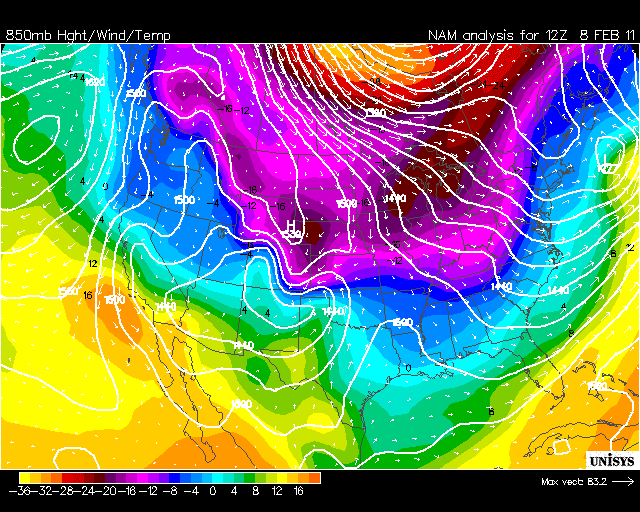 However, despite numerous sub-zero nights and abundant snow, this winter has not yet featured a MAJOR arctic outbreak. 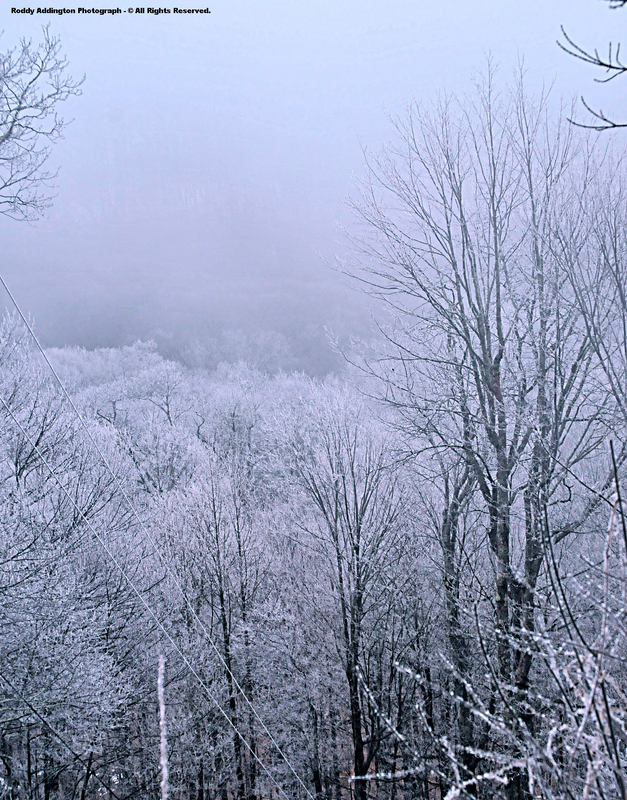 This is important since cold waves are a natural feature of the Appalachian landscape, vital to the ecology of the mountains, and have been lacking since the middle 1990s. 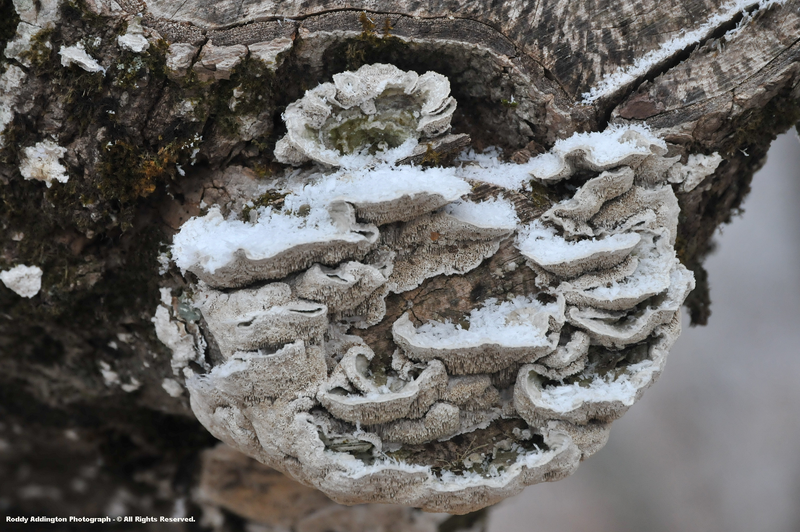 Many pathogenic organisms have taken advantage of this lack of harshly cold conditions, featuring sub-zero days and nights. While brutal, occasional such "spells" are actually needed to maintain a proper balance in the natural world of the Appalachians ( at least, as WE know them at this point in time ). It would be interesting if these little ones could voice an opinion on this notable climatic trend of recent decades, as what they would say might be surprising to many! "Outside the workshop window is a suet bird feeder hanging on the gray boards of the old barn. 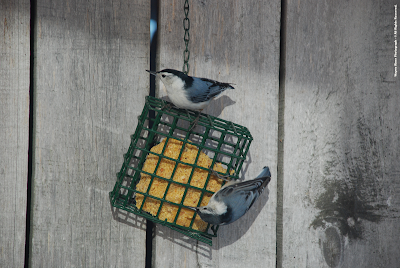 The feeder is a hidden place for small birds to have nourishment during the snowy winter days." White-breasted Nuthatches are year round residents of the area, with the Red-breasted Nuthatch ( Sitta canadensis ) being occasionally observed during both winter and summer in upper elevations of the High Knob Massif. Blackberry Image by Steve Blankenbecler - © All Rights Reserved. 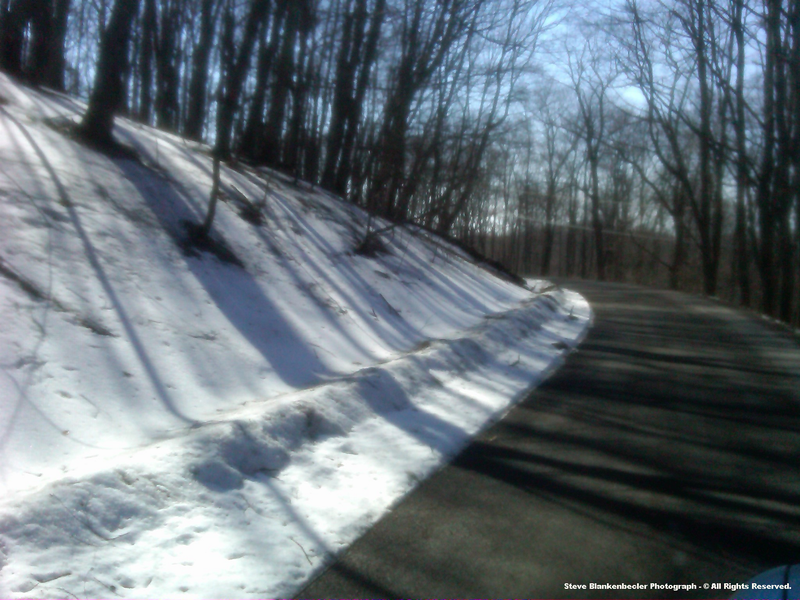 My friend Steve Blankenbecler submits this Blackberry image of northern slope snow cover hanging on tough amid upper elevations in the High Knob Massif, despite a significant stretch of early spring-like warmth. 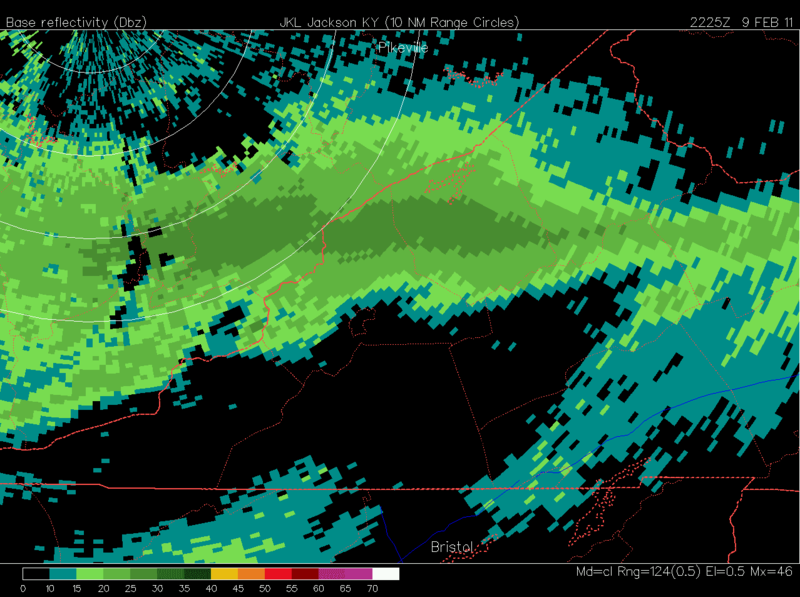 The most widespread snow being generally restricted to upper north slopes within the High Knob Lake, Big Cherry Lake, Benges, and Clear Creek basins of the massif. 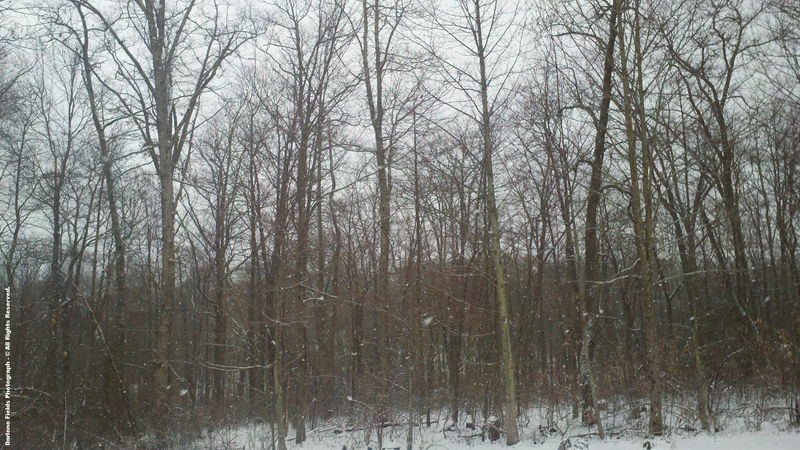 Day number 84 ( 12 weeks ) with snow cover during the 2010-11 winter season is in the books for colder locations of the northern slopes ( with 1" or more of snow depth ). 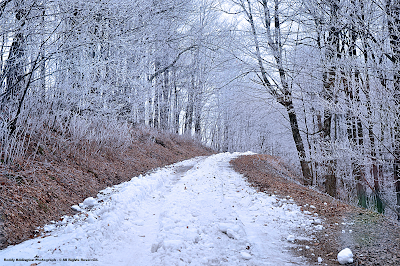 In the High Knob highcountry, average daily temps during the first half of February varied from 30s to near 40 degrees by day to the 10s at night above 2700 feet. Precipitation was much below average during the first half of February, with just over 1.00" in upper elevations on Eagle Knob. 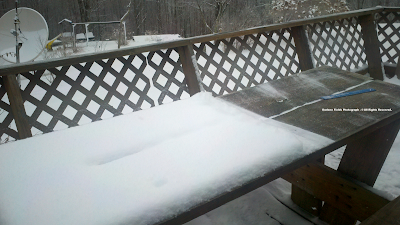 This included only 4.3" to 6.1" of new snowfall. [ Temps in upper elevations were cold enough to retain snow cover on slopes with northern exposures through mid month, as highlighted above, with extremes varying from sub-zero MINS in lofty basins on Feb 11 to MAXS of 45-50 degrees on Feb 15 ( 50-55 degrees being recently observed at highest elevations ) ]. 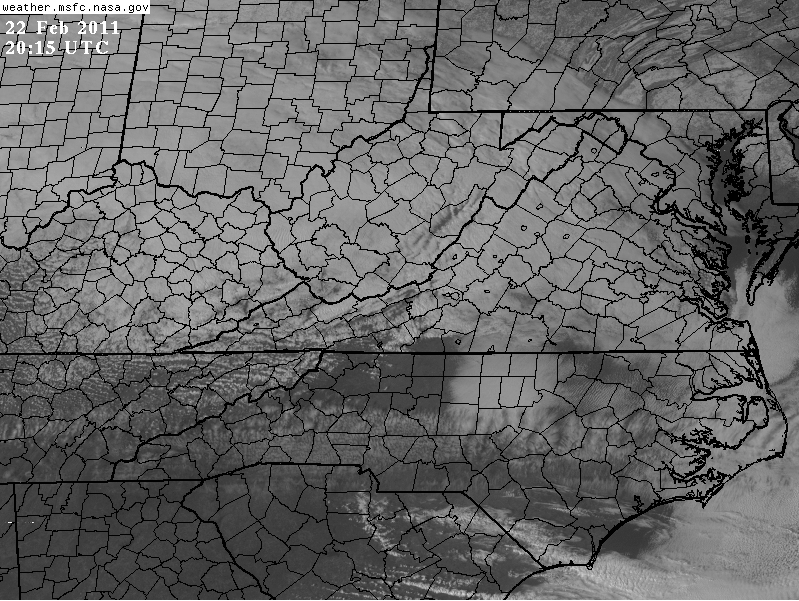 Strong SW winds roaring across the mountains generated some very interesting orographic wave clouds during the daylight hours of February 21, with a simply classic and very large V-shaped wave forming above Wise County, Va., just leeward of the main crest zone of the High Knob Massif. The City of Norton often sits beneath the bottom tip or point of the V, with outward spreading cloud flanks in the downstream direction from there acting to form this very large V-shaped wave cloud. For an individual cloud it is very LARGE to show up this well on GOES imagery ( Channel 1 visible ) from 22,300 miles out in space. 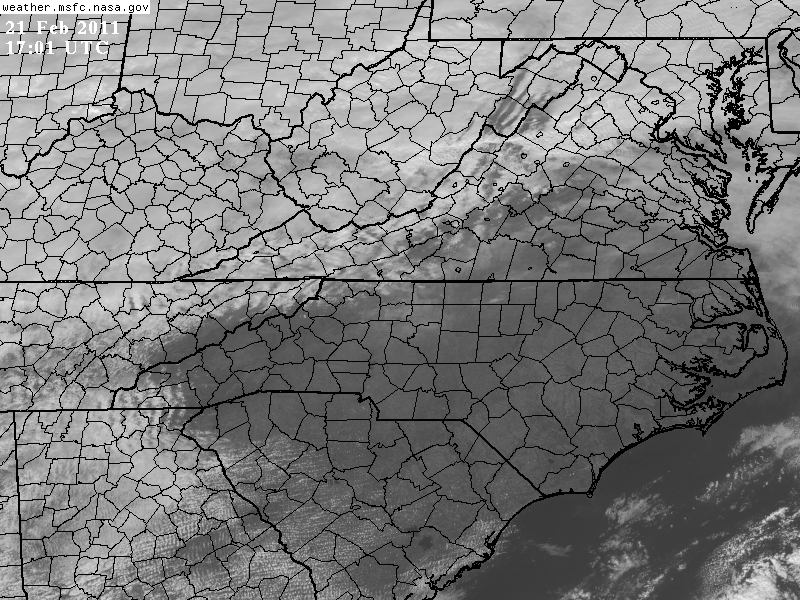 Looking upstream from the highlands of southern Dickenson County this would be an Inverted-V, but I will call it a V-shaped orographic wave cloud since the V is opening up in the downwind direction ( as illustrated below ). This very large orographic cloud has been observed many times in the past when strong SW air flows interact with the WIDE expanse of the High Knob Massif. 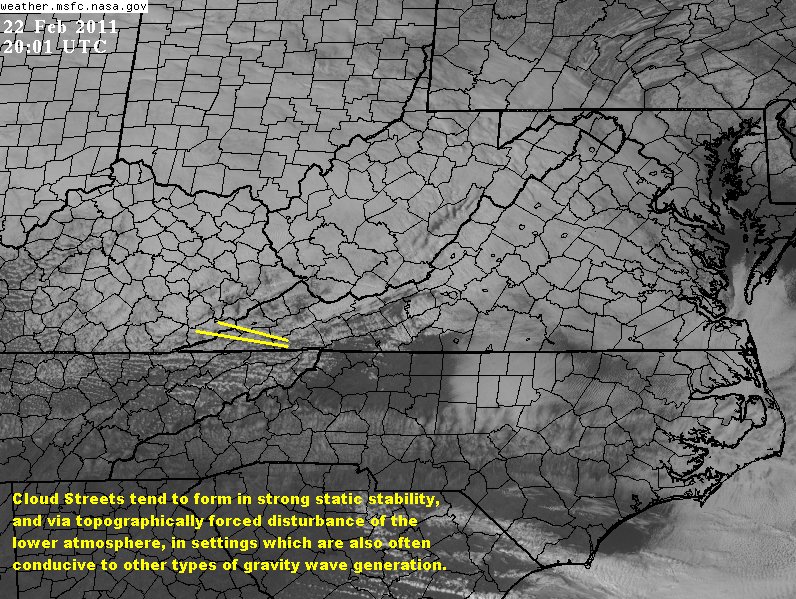 A V-shaped wave cloud of this type being indicative of air flowing across a WIDE mountain. It seems to be uncommon in the Appalachians, where mountain ridges are mostly narrow crested and relatively small in base to base width, to see such a large, well formed cloud of this size ( smaller V-shaped waves may be seen locally but most are not nearly large enough to show up from this far out as an individual cloud ). The above leewave has also taken the shape of a boomerang, with the bow apex just east of the City of Norton, as was observed for hour after hour on December 21, 2004. The viewing of this interesting wave cloud was limited on this day by higher altitude cloudiness, illustrated above by its colder, colorized tops. 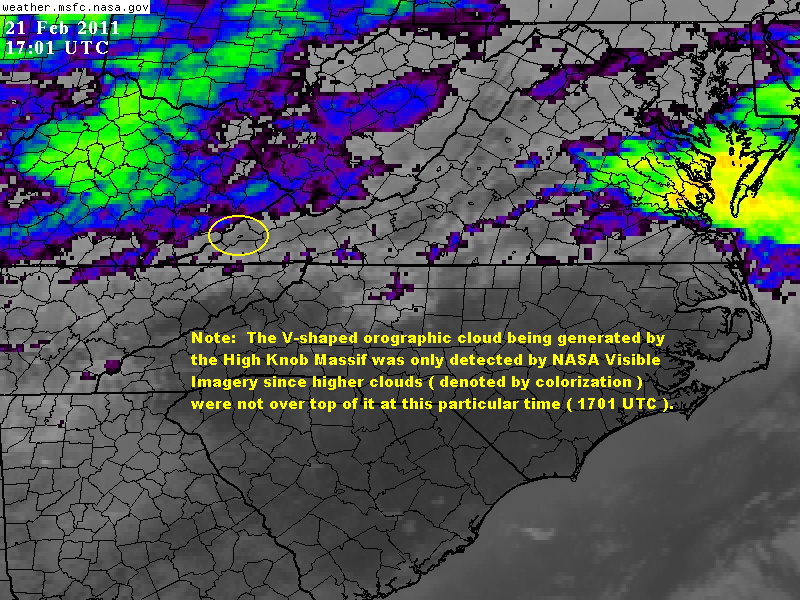 Note at the time of its viewing that NO colorized clouds were indicated inside of the yellow circle, with a clear view of this lower-level cloud forming in wake of the High Knob highcountry. 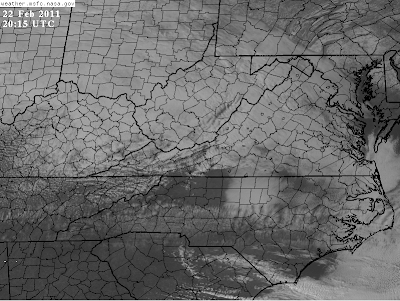 Since it has been observed standing nearly stationary as a leewave for many hours in the past, this cloud was likely present for much of the day but blocked from satellite view by clouds above it ( an interesting aspect ). The formation of a temperature inversion aloft created the perfect setting for cloud street development during daylight hours of February 22, as shown along the yellow lines below for the image above ( at 3:01 PM ). A typical decrease in temperature with increasing elevation through the lower atmosphere gave way to rising temperatures above the summit level of the High Knob Landform ( HKL ) to create a stable layer fit for the trapping of low clouds and for reflecting gravity waves back & forth beneath it! 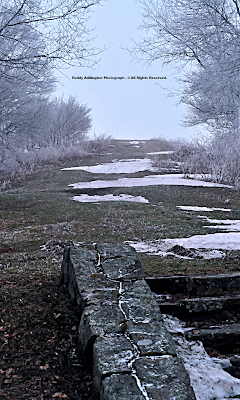 Low clouds obscured the summit level of the High Knob Massif for most of the day, with windy, cold conditions that trapped low-level moisture. Cloud streets also formed across northern portions of Tennessee, but the best development was from the Cumberland Block and High Knob Landform across western portions of southwest Virginia where moisture was more abundant. Cloud streets are also known as horizontal convective rolls, or Vortex Streets, since their structure is composed of a series of alternating upward and downward rolls. They can be common over the Ocean when cold air aloft runs above its surface ( a few appear off the North Carolina coast and over South Carolina ). 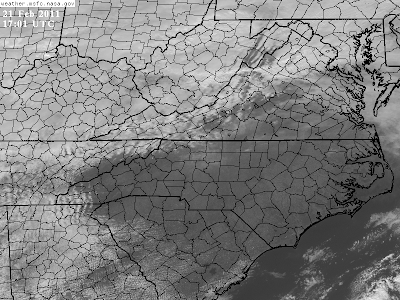 A very impressive cloud street stretched for many miles across southwest Virginia at 3:31 PM, from the High Knob Massif to the Iron Mountains of Smyth & Grayson counties, as air flow perturbed by the High Knob Massif converged along a line or axis downstream in its wake. 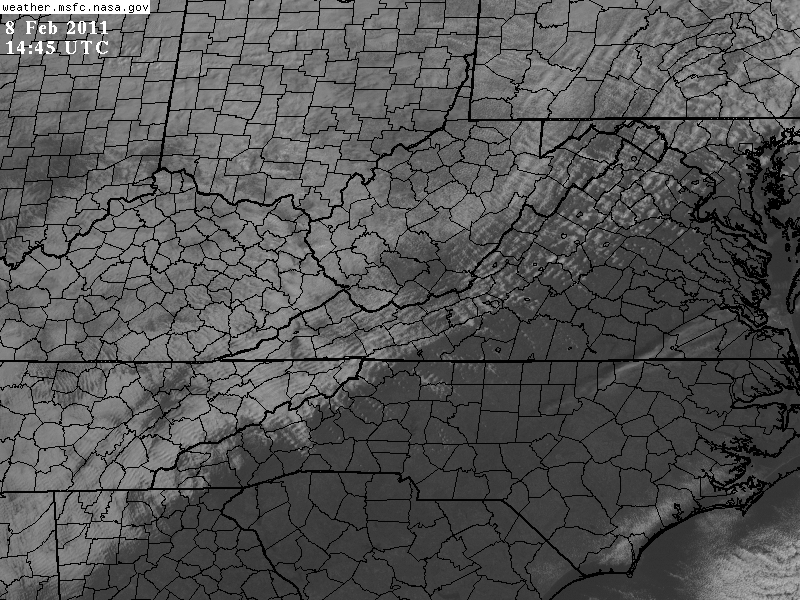 A thinner but very long cloud street can also be traced from the Cumberland Plateau across northeast Tennessee. 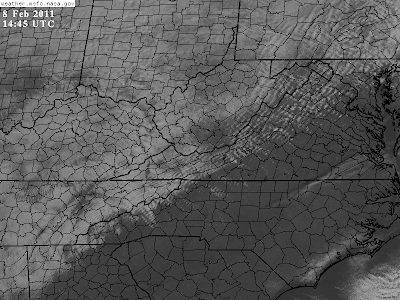 As the sun began to sink more detail became visible, with many fine gravity waves showing up along with the very persistent cloud street from the High Knob Massif across Scott and Washington counties ( part of these fine, gravity wave-like lines being individual segments of horizontal convective rolls of the cloud streets ). 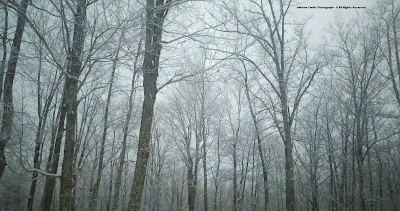 Darlene Fields reported snow flurries in High Chaparral of the High Knob Massif during evening hours of Feb 22, as cloud bases lowered to the elevation of Norton-Wise and riming engulfed the highcountry ( with drizzle north to Clintwood ).